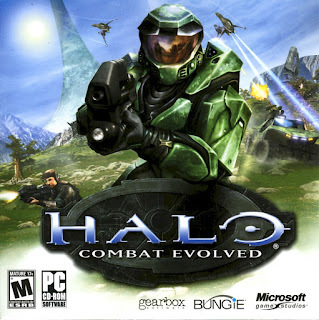 Halo: Combat Evolved is a first-person shooter produced by Bungie for Microsoft. The game runs well under WINE, but it won't install unless you first put mfc42.dll in C:\Windows\System32. I used Codeweaver's Crossover to install the game. Before the actual installation begins, make sure you have copies mfc42.dll to C:\Windows\System32 or the game will not install. Once done, you can install the updates, Patch-108 (the no-cd patch) and Patch-110 (removes and replaces Game-Spy servers plus several fixes). And finally, install msxml6, the Microsoft XML Parser to have the game display text. You can also download a full set of saved games. This allows you to play and level rather than forcing you to work your way through each mission. There's a nice tutorial by Benjamin7 at HaloWaypoint that details a generic WINE install and provides a nice startup script. He also provides install instructions for creating custom maps. The source for many things about Halo:CE is at PC Gaming WIKI. There you will find info on widescreen, FOV settings and so on. A mod that adds several useful visual and gameplay features is Chimera. Custom maps can be found at Halo Maps and some at OpenCarnage. A detailed Wiki is at Halo Nation and at PC Gaming Wiki. Halo Custom Edition is a free add-on to Halo. You must have you installation key to install the game. You also need the Patch. I haven't yet used any hi-res textures for Halo, but there are some out there. If you are aware of any, please let me know. Here is the Halo Ultimate Enhancement mod from Bungie. There are several interesting things there to "improve" your game experience. The Chimera mod mentioned above does allow you to remove the capped frame rate of 30 FPS and makes game play smoother. And you might want to check out Halo Anniversary.